You don’t need a scientist to tell you what is mostly self-evident: that it’s kinda cool having plants around. They will tell you if you ask them nicely, though. Because plants are good for you in a variety of different ways, and there’s a substantial body of evidence to back this up. People in hospitals recover more quickly when there are plants and flowers either in the room or viewable outside. And according to a NASA study, indoor plants can help clean pollutants from the air. There’s a link between vegetation and lower criminality , and those that the plants can’t save report fewer health problems when their cell looks out onto foliage-type stuff. Having a plant in view of your workstation can aid creativity. And that’s got to be a good thing. Unless you hate creating stuff, of course. Somewhat less scientifically, they’re just a nice thing to have around, aren’t they. In fact, when I rented a room in Seville last year, I’m pretty sure that my decision was (positively) affected by the plantiness of the flat. Probably best not having red plants around though. Not that I have anything against them per se – some of my best friends are red plants (*sobs*) – it’s just that even a brief glimpse of the colour can negatively affect your intellectual efforts. Green is a much better bet. Green. You know, like the colour of… oh I dunno. Possibly overdoing it a tiny bit. So what are you going to do with this information if you’re travelling? Well, if you’re renting a place for longer than a couple of weeks, then maybe it’s worth getting a bit planty. Putting plants in your accommodation, even if it’s only temporary, is a good way of making a place feel like your own without the social exclusion that comes from scent-marking. Plants are not a difficult thing to acquire, either. You can get them from supermarkets, from IKEA (currenly in 38 countries) or even just, I dunno, from plant shops. You might want to watch these exotic plants though. I met a peace corps worker in Honduras who told me that a colleague had grabbed a plant whilst they were trekking and… I can’t quite remember. I think his face fell off or his head blew up or something like that. No, that was it – his hand went red and sore. If you’re sticking around for a while, you could plant some seeds yourself and watch them grow. This is the kind of thing that brings out the sense of joy that comes with nurturing something (or murdering something, depending on your gardening ability). If you’re co-working, then you could factor it in to your choice of office. You could even bring your own plant, assuming they allow it. Be sure to let everyone know when you arrive: “This is my plant. He’s called Lionel.” You certainly won’t get many of those pesky conversation-related interruptions. Travelling around brings with it its own restrictions. I suppose you could always travel with a plant. It would at least make for a humorous novelty travelogue, and you’d also have something to talk to on those lonelier nights on the road. If you get a tall plant, like a Dracaena, you could even give it a hat, coat and sunglasses. It could be your new travel buddy. This might be useful at border crossings, too, where plants are often viewed with suspicion. But rather than surrounding yourself with the potted versions, why not get out into the wild? The images below are the views I had from an outdoor desk at Hostería Rose Cottage in Ecuador, where I stayed for a while to got some work done. That said, I’m unsure of the impact on relaxation of being in sight of four volcanoes. 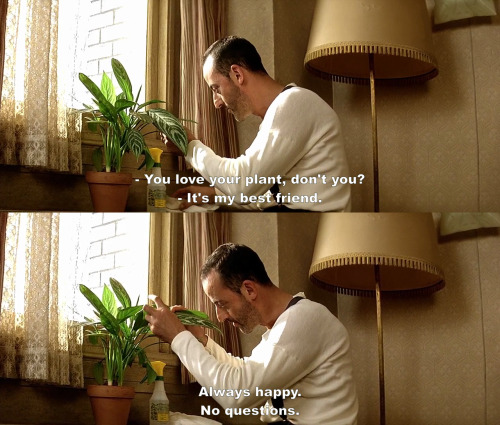 Do you like plants? Do you buy plants for the places you stay in? Do you want to hug them and squeeze them and call them George? How about travelling – would you travel with a plant? If so, which genus? And how would you resolve the inevitable on-the-road disagreements? I watched a programme not long ago about a woman who did house-sitting for a living. Behind her van she towed a small trailer with her plants in it so that she always felt at home wherever she went. I still have indoors at home the Ficus benjamina, weeping fig, I had in my office 20 years ago although I have had to attack it to try and contain its size. Apparently Ficus benjamina has been shown to effectively remove gaseous formaldehyde from indoor air. If you had enough plants you wouldn’t need to travel anywhere – you could just hang out in them; maybe set up a jungle tour. Regards the cleaning properties, it’s worth reading that NASA paper I linked to. How about a wandering plant to go with your wandering desk? A Triffid would be, er, teriffic. You need to keep it on a lead, of course, but it would also be a form of personal guard and could transport itself. Problem is it is liable to strike people blind so could reduce your readersership. I could probably get a saddle on it as well. I suppose I could travel with one of those Amazonian walking trees, but given that it’s a misnomer I think I’d have to be really into the whole ‘slow travel’ concept. Not sure about plants, always seem to over water them, but the feel of the wilderness really appeals to me. Reading this has me smiling as I have similar issues with plants myself. I love the idea of having one, but as most go the way of the compost bin I don’t think they agree with me! I buy them depending on the season I think – we always have poinsettias at Christmas and then orchids in the summer but neither last beyond a few months. Maybe that would be the same for a travelling plant? The species you have is dependent on the weather. Are you going anywhere hot in the future as your companion could be a cactus – that seems to be the only species that can survive in home and it hardly needs watering! Yes a cactus would be a good travel buddy, as long as it doesn’t put its arm round me when it gets drunk and is having trouble standing. Taking time out from the cold in a Wroclaw cafe.